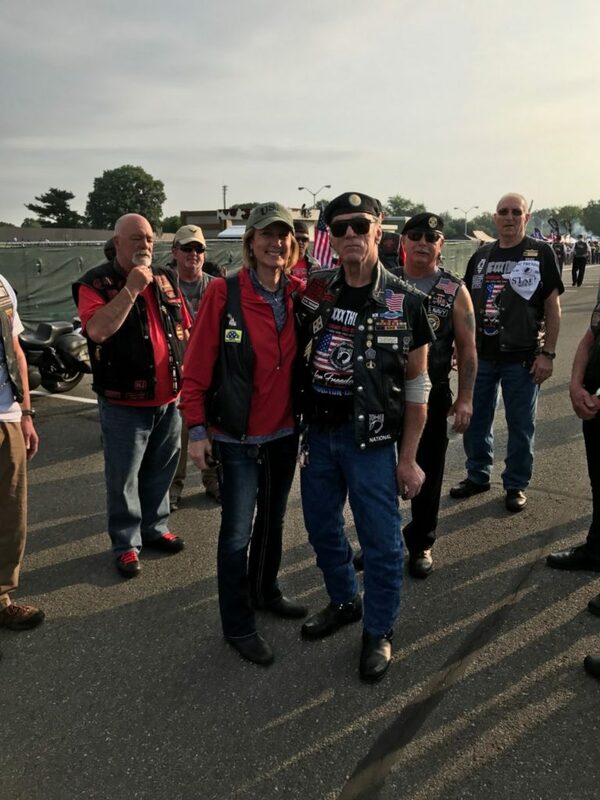 2 Jun 2017 Washington, D.C.
Rep. Claudia Tenney (R-NY), a freshman conservative House GOP member from New York State, rode with Secretary of State Rex Tillerson and the Rolling Thunder in Washington, D.C., on Memorial Day. 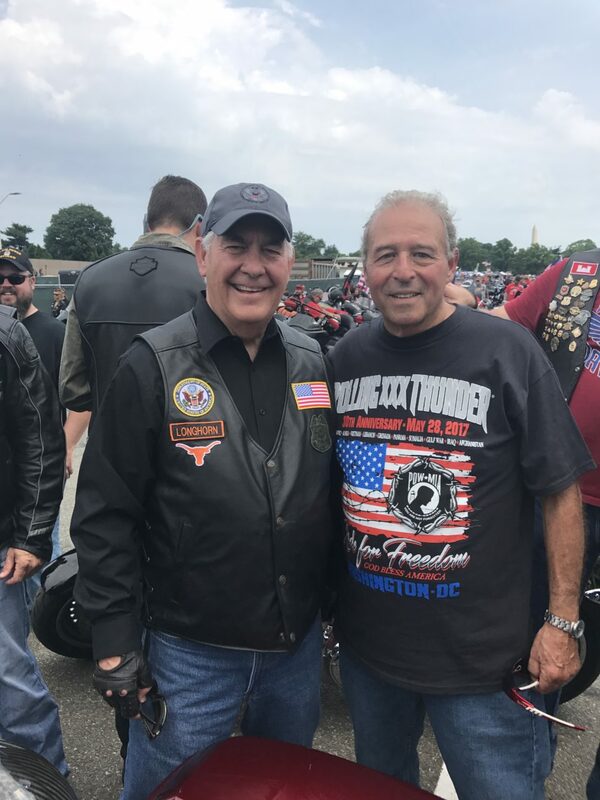 In an exclusive interview with Breitbart News after the fact, Tenney said she was honored to join Tillerson as the only member of Congress on the Rolling Thunder ride to remember prisoners of war and those missing in action on Memorial Day weekend. It was really cool. 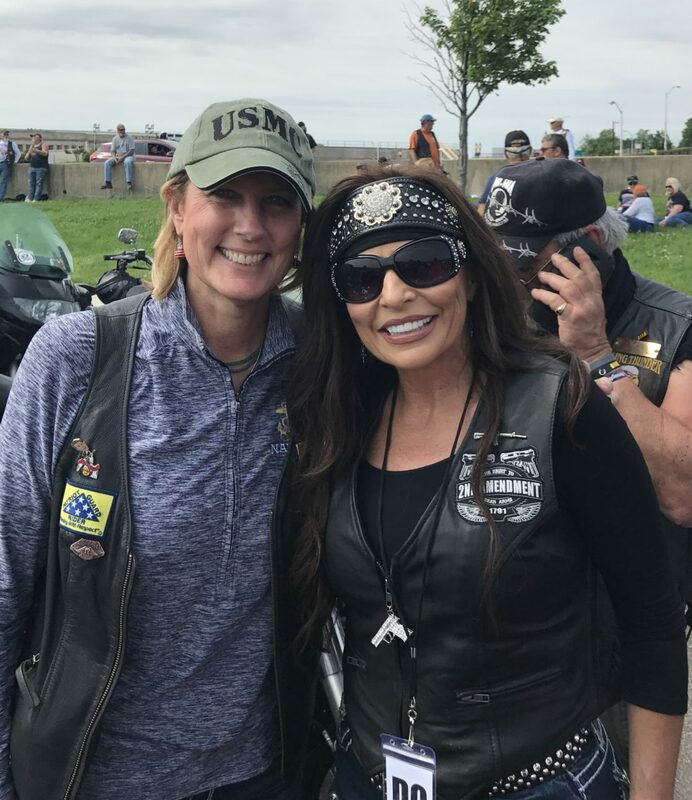 Harley reached out to me and said ‘hey we see you’re a Harley rider and a member of Congress. Do you want to go on a ride?’ I was like ‘sure, but the complication of getting my bike down there is a lot.’ They said ‘well, we’ll provide you one’ and I was like ‘super.’ So they had this whole little ride on Saturday night and they had the guy who owns the Harley in Annapolis and so we went to his house. 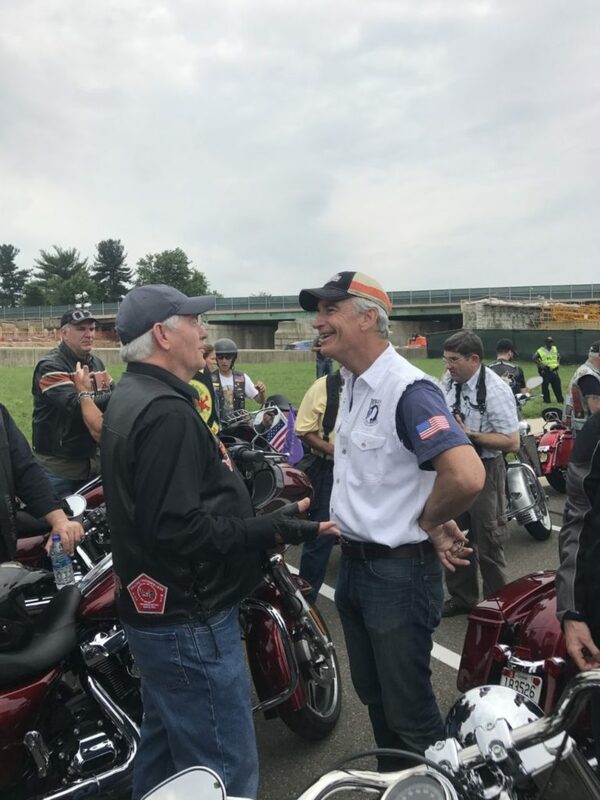 When we went to go on the ride, we all met at the Harley offices on Constitution and it was funny—all of a sudden in rides Rex Tillerson with like two people. We didn’t want to say anything because the Secretary of State was riding with us, but we went for a ride—it was like an hour and a half. We went out through the Virginia countryside and it was like the CEO of Harley, the CFO, the government operations people, two other people and it was just fun. He was like right in front of me—it was like him, then a Secret Service guy and then me. So we just rode together. He’s such a nice guy. He was so down to earth and everything, he was just fun. We rode all over the beautiful countryside in Virginia, it was kind of like being in upstate New York. That was kind of neat and then we ended up at Josh Bolten’s house for dinner, you can see him in the pictures, and then the next day we all ended up at Rolling Thunder and rode with him and he was just incredible going around and saying hello to everybody and posing for pictures and mostly I think he was just so gracious. 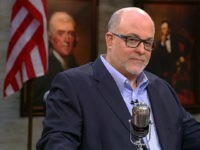 I was really impressed and I had a chance to talk to him about some things about the job and Trump and it was a really interesting opportunity to sort of talk with him. He was sort of stunned that I was on my own bike. He’s like ‘you’re on your own bike?’ and I was like ‘yeah, I ride my own.’ It was cool. He was just incredibly nice. “I rode behind him so I got to watch the whole time,” Tenney said. It was great doing Rolling Thunder. I always wanted to do it. 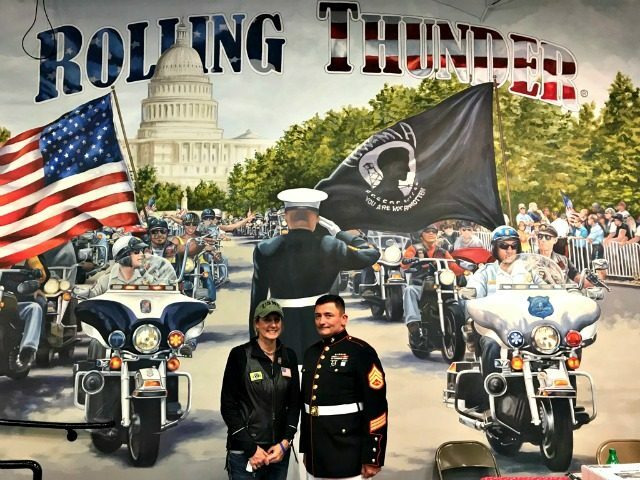 My son, who’s an active duty Marine and serving in the Middle East right now, just knowing that we should honor veterans every day but Rolling Thunder is special because we honor our fallen. There’s so many. The ride was instituted to honor the missing in action and POWs, so it’s special in that way. 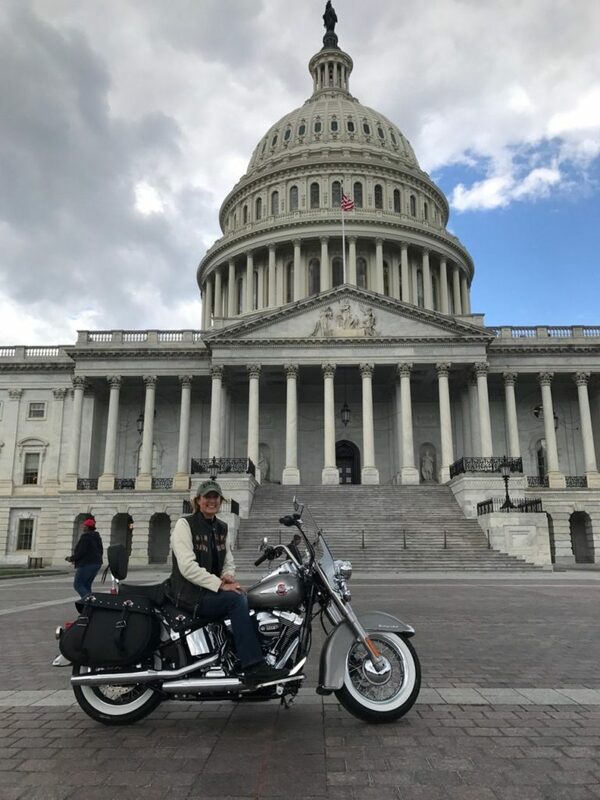 They started it with only 2,500 motorcycles 30 years ago, and so this was the 30th anniversary—I was the only member of Congress there. One of the things I thought was remarkable was how many Marines were out there. 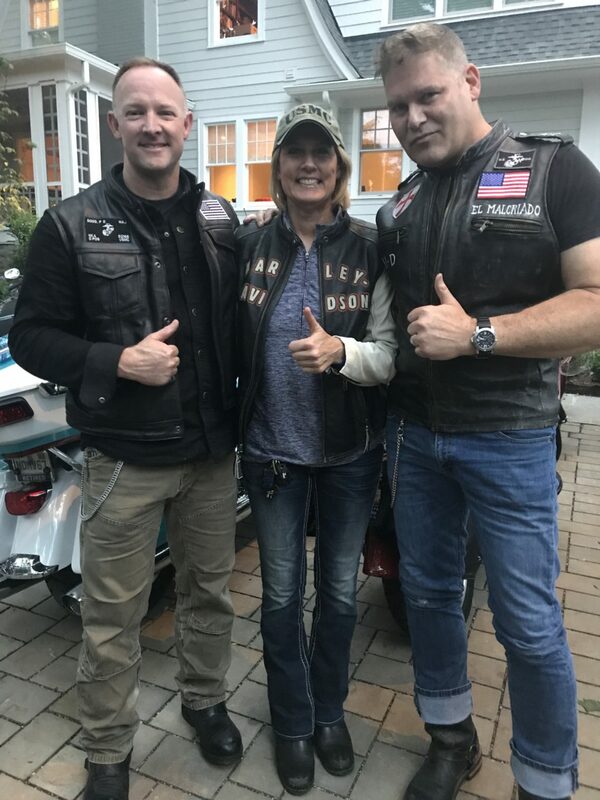 I texted my son in Kuwait and I said ‘there are so many Marines out here’ and he said ‘Marines and motorcycles: they go together.’ It was funny because there were just Marines everywhere and I used to be the lawyer for the Marine Corps in our area and I just know a lot because of my son’s affiliation with the Marine Corps, I end up doing a lot of their balls and events, and we have a Marine outreach center that we take care of. There were a lot of veterans for Trump and the fact that Trump is so pro-veteran is refreshing. He gave the military increases and we put through a bill that reduces the wait time and facilitates faster appeals at the VA—there’s a lot that’s been done that’s been pushed through for the president on our side and is maybe waiting in the Senate, some of it. Just having the Secretary there—they all wanted Trump to be there because I guess he was there last year—but it was really moving. The number of people on the street was just astounding to me, just the spectators. And it started to rain also. There were people everywhere, wall to wall people the whole ride—and so many motorcycles. I don’t know how many they estimated. The Gold Star families were some of the most important people represented. They were there, some of the Gold Star mothers from my district were there who I’ve known for years back to my time in the state assembly. Just about everybody had an American flag, and no problems supporting the American flag and the troops and freedom and Second Amendment rights and all those things. It was very interesting times, and very emotional. They’re people who believe in our Constitution, in freedom, and here they are in a massive group supporting our military. I didn’t see any protesters there—I don’t know if it’s because motorcycles are viewed as ridden by people who are pretty badass. I couldn’t believe the number of people. They said there were three full lots in the Pentagon—it was just jammed with motorcycle after motorcycle, patriotic people who care about our veterans and care about our country. That was really moving. 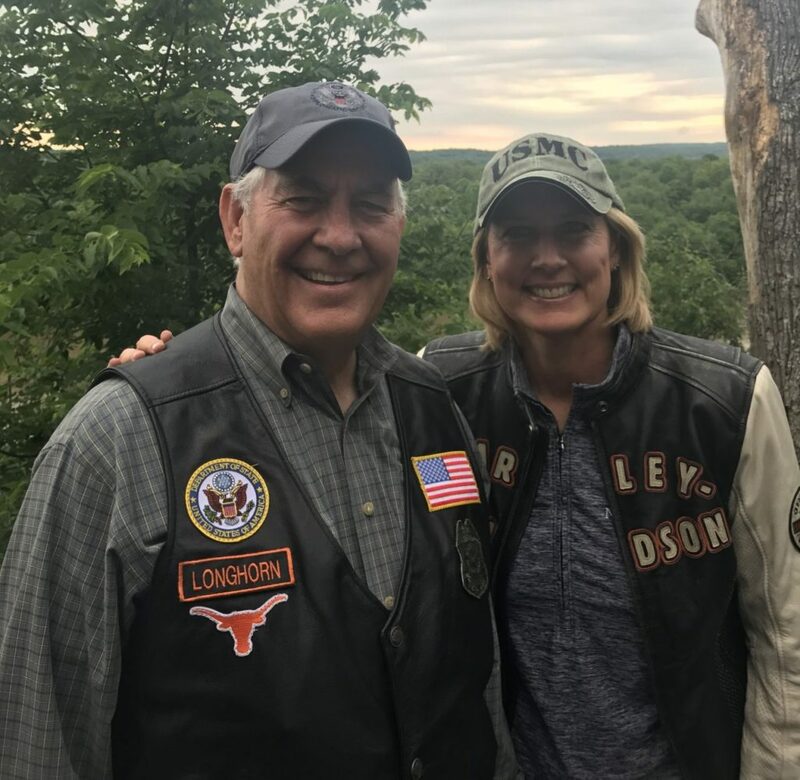 And the fact that Rex Tillerson, or T-Rex or whatever they call him, he was just out there like any other person meeting folks, shaking hands, getting his picture taken with everyone, really down to earth, really gracious, and I was just really impressed. The next day, people loved Mattis too. Marines love Mattis, Mattis is like a hero to the Marine Corps. I thought Mattis did a great speech and I thought Trump’s speech was great, recognizing the Gold Star families—that’s what this is about—was really great. I thought the speech was really well written, and I know he likes to ad lib a little bit and he did a little but not too much. I thought it was really in line with the Rolling Thunder folks. 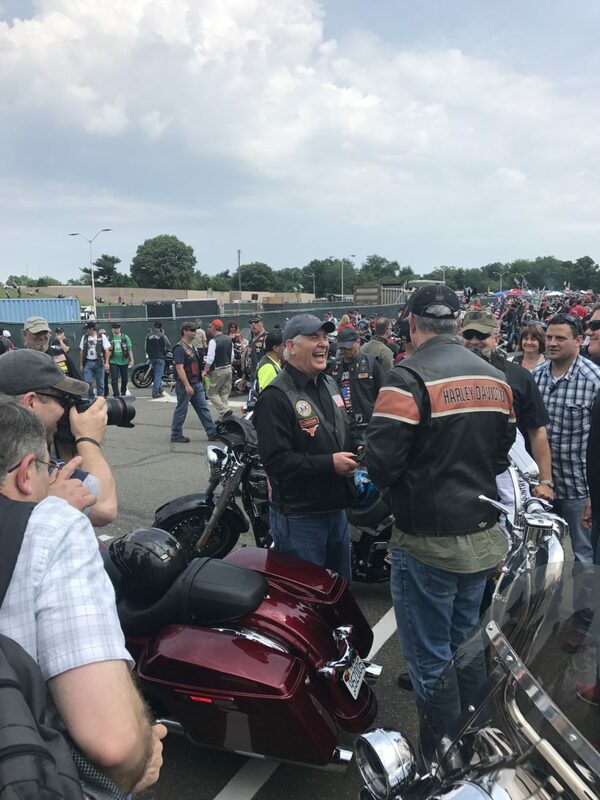 I bet Trump would have loved to have been down at the Rolling Thunder. 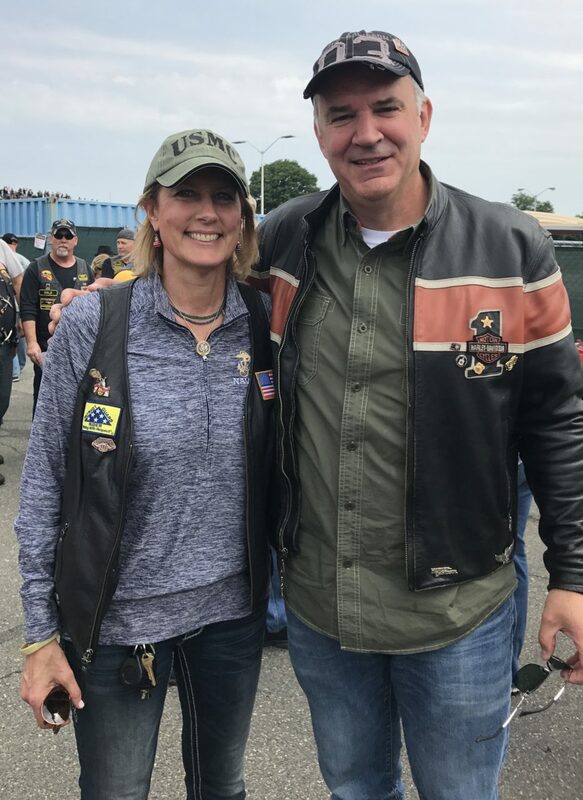 Tenney, a lifelong motorcycle enthusiast, noted too how she loves to ride her motorcycle around her district to see all the highways and bridges named after veterans and those who have given the ultimate sacrifice serving their country.